In September 1958 I travelled by bus, with my bicycle on top, on transfer to Lettermore station in South Connemara. The station is situated a quarter mile off the bus route. Dutifully the Sergeant, Tony O’Doherty, and Garda John McCullough met me at the bus to help with my luggage. It seems strange now to reflect on the transport they used: two wheelbarrows! The sergeant and three gardai lived in the station and we did our own cooking, each for a week in turn. This experience of cooking and learning from each other stood us in good stead afterwards! The facilities in the station were spartan or non-existent. As those were pre-electricity days, our means of light was an oil lamp and globe. We had running water in the station, but for some reason nobody thought of installing toilet facilities there. These were provided in a shed 50 yards away and were of the dry variety. Central heating was something else we hadn’t dreamed of at the time and we kept ourselves comfortable with an open fire. 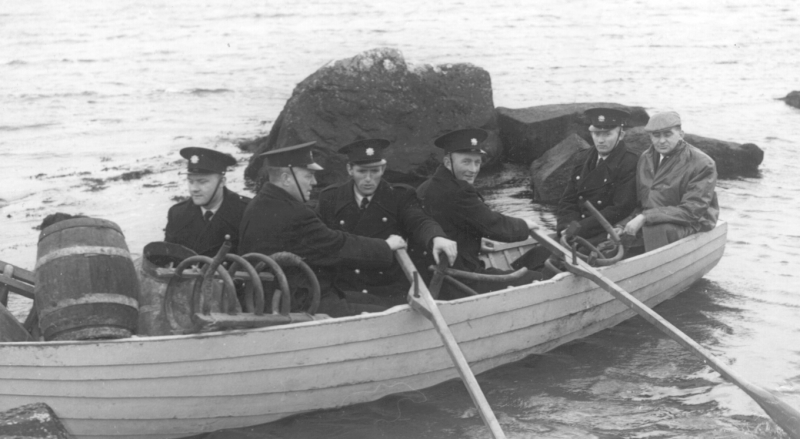 On poitín duty at Inishterk, Lettermullen, with other gardai in February, 1961. The cost of fuel had to be strictly accounted for and any excess over the previous year’s expenditure had to be explained. No fuel expenditure was allowed for the period April to September inclusive as the weather during this period was deemed to be such that heating was unnecessary. It is only when measured against these standards that the improvements in working conditions which have taken place in the intervening years can be fully appreciated. Nobody in the public service would be asked to work under those conditions nowadays, nor would they be prepared to do so. Our official duties were conducted almost entirely through the medium of Irish, which I enjoyed. Although the Connemara “blas” is different to that of my native Coolea in West Cork, it didn’t create any great difficulties. Our work was varied which gave us an opportunity to meet and get to know the people in our area. A Garda visited each school in his area at least once a month to give a talk on road safety and to ensure that no pupil was absent without a reasonable excuse. Every Darda in the station was fully occupied one day per week certifying Unemployment Assistance forms at the station and at outlying areas. “Poitín duty”, as it was known, took up a lot of garda time in south Connemara, especially approaching Christmas. There was no stigma was attached to a conviction for making, supplying or possessing poitín but I witnessed a lot of unfortunate results from consumption of illicit spirits. Ironically, some poitín makers welcomed garda activity in relation to poitín as it limited the number of producers, and consequently the value of the product increased! Collecting Agricultural Statistics was another job gardai had to perform for a month or so each year. This entailed visiting each household and taking particulars of the number of milk cows, calves under one year old and all other animals owned by the householders. Information on fowl was also asked for, even down to the question of the number of eggs laid yesterday. I remember one occasion, having recorded all the details from a conscientious wife, her husband came along and enquired what information she had given under each heading. He told her in unparliamentary language that she had overstated the number, so I had to drastically downgrade his standard of living. No doubt he didn’t want officialdom to get the wrong idea about his wealth. I found myself apologising for causing so much trouble!